Israeli jets on Thursday bombed several areas near Damascus as well as in southern Syria, the Syrian Observatory for Human Rights monitor said. 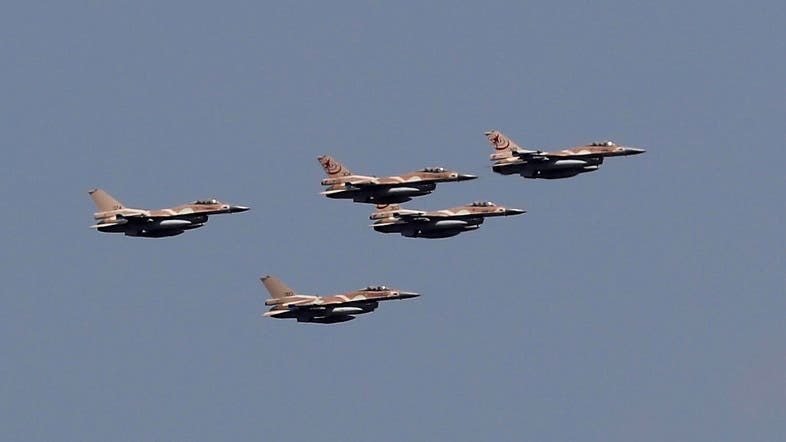 “Israeli forces bombarded for an hour positions in the southern and southwestern suburbs of Damascus as well as in the south of Syria at the border of Quneitra province” the Observatory’s chief Rami Abdel Rahman said. Earlier, Syrian state media said air defenses downed a number of “hostile targets” close to the capital. “Our air defenses fired on hostile targets over the Kisweh area and downed them,” the official SANA news agency reported, citing a military source. The area south of Damascus has been targeted by alleged Israeli strikes in the past, which a monitor said have killed members of Iran’s elite Revolutionary Guards force and other pro-Iranian militias. Abdel Rahman said there are “weapons depots belonging to the Lebanese Hezbollah (group) as well as Iranian forces” in Kisweh. Israel has carried out hundreds of air strikes in neighboring Syria against what it says are Iranian targets. Syrian air defenses in September opened fire to intercept alleged Israeli missiles targeting ammunition depots in the northwestern province of Latakia, but instead downed a Russian jet. Abdel Rahman said Thursday was the first time Syria’s air defenses had been called into action since the incident on September 17 in which 15 Russians were killed. Moscow pinned responsibility for the downing of its jet on Israel, saying its plane used the larger Russian one for cover, an allegation Israel disputed. Following the incident, Russia sent advanced air defense missiles to Damascus. Israel’s Prime Minister Benjamin Netanyahu told Russia his country would continue to hit hostile targets in Syria to prevent Iran from establishing a military presence across the border. He added that Israel would “continue security coordination” with Russia. The Astana process by Russia, Iran and Turkey to end the Syrian conflict has only led to a “stalemate” in efforts to establish a constitutional committee crucial to a political settlement, the US said on Thursday. Establishment and convening of the committee by year’s end “is vital to a lasting de-escalation and a political solution to the conflict,” State Department spokeswoman Heather Nauert said in a statement. Her comments came after the outgoing United Nations envoy to Syria, Staffan de Mistura, regretted that there was “no tangible progress” on the composition of the constitutional committee at two days of talks which ended Thursday in the Kazakh capital Astana. Moscow and Tehran, allies of the Damascus regime, began the Astana process in January 2017 along with rebel-backer Turkey. The Astana process followed a Russian military intervention which tipped the military balance in favor of Syrian President Bashar al-Assad’s authoritarian regime. The Astana process has gradually eclipsed the earlier UN-sponsored negotiations framework known as the Geneva process, which had put more emphasis on political transition but failed to curb violence that has killed more than 360,000 people and displaced millions. Syria’s war began in March 2011 as an uprising against Assad but morphed into a complex conflict with myriad armed groups, many of whom are foreign-backed. Will Moscow host Syria-Israel peace talks?